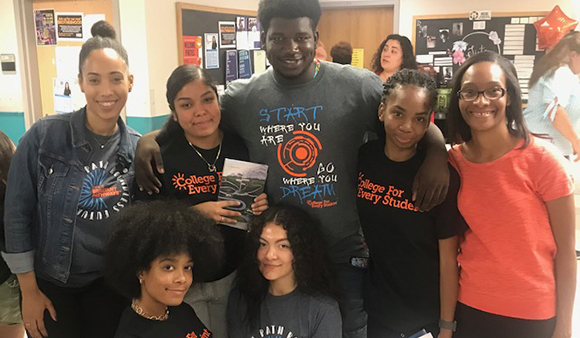 First-year CFES Brilliant Pathways students at the University of Vermont joined forces at a welcome dinner and tabling event at the UVM Mosaic Center for Students of Color to support each other and spread the word about services available to CFES students to ensure their success. CFES’ participation in the September 14 tabling event was in support of the “UVM Success Cluster” – a new initiative designed to help CFES students feel connected and supported by each other as well by campus liaisons from admissions, support services and other departments. CFES plans to implement the cluster model at other colleges and universities across the country where 2,500 CFES scholars enroll each year. Fifteen incoming UVM-CFES Scholars primarily from Pelham Preparatory and Eximius College Preparatory Schools in the Bronx came to Mosaic Center event. Four of them staffed the CFES table distributing information and talking about their experiences as new students at UVM. CFES attended a UVM admissions event earlier in the week where academic support staff from each of UVM eight colleges met with CFES students in their respective majors.